For those tired of staring at their old and ugly airbag wheels, there is a solution: retrofit a new sport or stock airbag wheel with the BMW roundel badge! This procedure applies mainly to E36's without badged airbags but is applicable to all BMW's from 7/90-3/99 (meaning all 3/5/6/7/8 series). 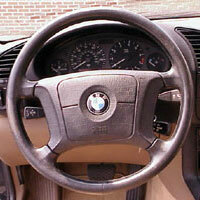 From 3/99, BMW transitioned to two-stage airbags. They are NOT recommended for earlier cars (although it's been attempted). 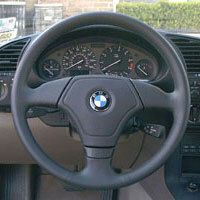 For those with badged airbags ('95-on, except M3) who just want to retrofit	a sport wheel, the procedure is very simple. With these cars (build date of 9/94 or later using slip ring '111) it should be a direct bolt-on/plug-in process. 92-94 cars and all M3's use two other slip ring part numbers (either '901 or '804) which necessitates simple wire splicing to make the new slip ring compatible with the car's wiring. The steering column switch bracket (p/n above), which holds the column switches, will also need to be changed to comply with this newer slip ring -- a very minor task. This write-up assumes use of new slip ring (p/n 32 34 1 162 111) for all installations. Retrofitting a non-badged M3 wheel into a non-M car will require variation of the procedures listed below depending on model year because this wheel uses slip ring '804. 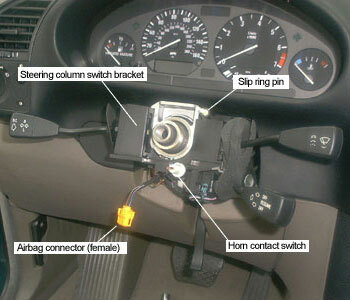 Therefore, '95-on cars require that you revert to the '94 wiring including horn switch and column switch bracket. 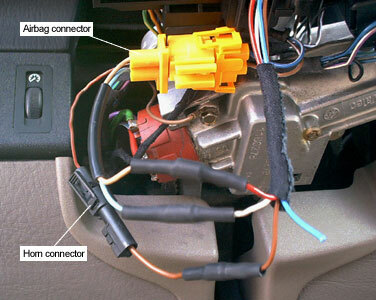 92-93 cars require only airbag wire splicing. Exceptions to the '95-on procedures: some convertibles thru '97 may have used slip ring '804, and M3's from 3/98 use slip ring '111 and are therefore plug-n-play. As mentioned, attempting to install an E46 airbag wheel into an E36 isn't a good idea. E46's use a two-stage airbag system with four wires for the airbag instead of two, creating a host of compatibility/safety issues. They also employ column mounted slip rings (instead of wheel mounted) with different airbag-to-wheel wiring. Use of a new slip ring is advised because used ones may have broken wiring contacts hidden inside. A used slip ring which turns more than 2.5 revolutions off center (or keeps turning) is defective. 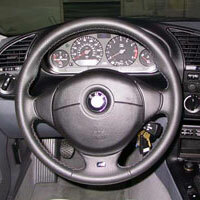 A 3-spoke wheel can really transform the interior of your car with a slimmer, more modern look. These newer airbags may be of the "second generation" type - a bit safer? - although I can't confirm this. I've also discovered some manufacturers (Mercedes, Alfa) call for airbag replacement and/or servicing every ten years, suggesting a useful life for the original equipment. If working on your airbag-equiped wheel looks intimidating, study and research the procedure in the Bentley manual until you feel comfortable. With the battery disconnected and airbag unplugged, you should be completely safe. Still, this procedure is offered at your own risk. 1) I always suggest referencing the Bentley manual for "official" methods and research. See sec. 721 for info on your airbag system. Most importantly, disconnect the negative terminal from the battery and wait at least 10 minutes for capacitors to discharge before beginning work. 2) Remove upper and lower trim pieces from around your steering column. Unplug orange airbag connector under steering column. 3) Using T-30 torx bit, release two retaining screws from behind airbag. Disconnect airbag and remove. Lie airbag with front facing up. Handle with care. See Bentley manual. 4) Align front wheels straight ahead. Using breaker bar, release steering wheel bolt and remove wheel. It's on tight! 5) Disconnect horn connector under steering column and remove horn contact switch from column switch bracket. 6) Cut horn connector from horn contact switch. 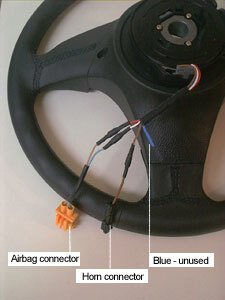 Cut orange airbag connector from old slip ring (attached to back of steering wheel). 7) Prepare the horn and airbag connectors by splicing common electrical terminals on each end. I used bullet-type terminals and soldered them. See image below right. 8) Working on the new slip ring, locate the connectors for airbag (yellow/black) and horn (black/clear). Cut off these connectors and splice in common electrical connectors. The brown wire is the horn wire; blue goes unused. See image below right. The new steering column switch bracket will have slip ring pin located on left side of column. Horn contact switch goes unused. 10) Heat shrink the tubing. Check connections. See image below left. We're now done with wiring! 11) Back in the car, remove column switches from bracket. Release underside screw and remove column switch bracket. 12) Release slip ring pin from old bracket and insert in new bracket. Install new bracket and replace column switches. Under steering column with new wheel installed and connectors in place. 13) OK. It's all ready to go in. Remove red centering pin from new slip ring. If re-using old slip ring, verify it's centered (it should turn no more than 2.5 revolutions in each direction). 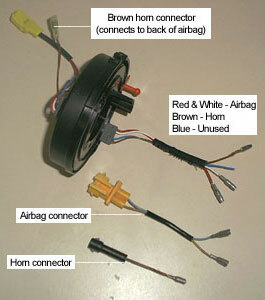 Secure slip ring to back of wheel with the small screws (see image above left). Install new wheel and secure with bolt. See that slip ring locks into pin on steering column switch bracket. 14) Connect yellow airbag plug and brown horn connector to back of airbag. Install airbag and secure with T-30 torx. NOTE: Due to the way the airbag plug is made, it may disconnect itself when you push airbag into position if the wires press against the plastic warning label inside wheel. Check that airbag plug wires are routed outside warning label and are free to move, or remove warning label entirely. 15) Working under steering column, connect airbag and horn. 16) At this point, re-connect battery ground wire and turn on ignition. Check that SRS warning light turns off and horn is functional. You've done it!! These cars use a slightly different stock slip ring (airbag connectors are different from 92-93 but same as '95-on). However, the horn circuits are the same as the 92-93 E36's. This means you'll only need to splice into the horn wire on the new '111 slip ring and replace the steering column switch bracket. The airbag connector will be a direct plug-in, saving time. The procedure is the same as above, omitting airbag wire splicing (most of steps 6-9). Easy! You guys have it easy. This should be a direct plug-in job, not even requiring a steering column switch bracket. As long as you're already using slip ring '111, follow procedure above but omit steps 6-12.